A muggy evening here in Kassel, as I sat having my rollers done whilst listening to the Duke's famous opening aria 'Questa o quella' over the tannoy. 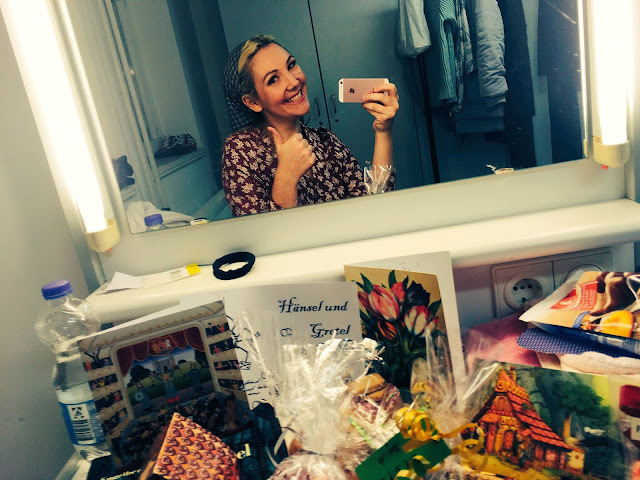 My role - Maddalena, the ultimate 'tart with a heart' - doesn't sing until the 3rd Act, so there was plenty of time to soak up the First Night atmosphere backstage and to watch my colleagues from the wings. A couple of hours later, I am ready, curled and powdered to step out onto the mist-filled stage. I cajole and seduce the Duke amidst lightening flashes, murderous glances, and some of the most dramatic music Verdi ever wrote. Afterwards, we do as Verdi would have wanted and wash down the opening night with wine and pizza.